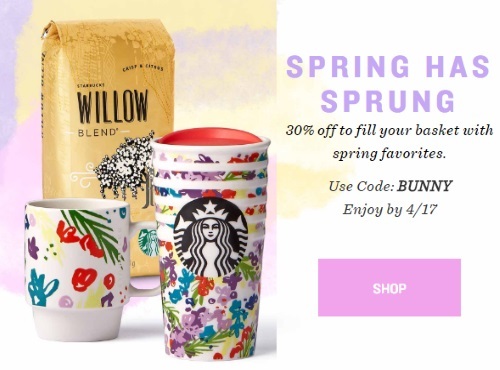 Starbucks is offering an Easter Sale on their online store right now! Save 30% off your order and fill up your basket with all the spring favorites. Enter the promo code BUNNY to get the discount online at the link below. Offer ends 4/17/2017 at 11:59 pm PST. Offer valid online in Canada only. Charging Coaster Starbucks, Starbucks Reserve Coffee Subscriptions, Headphones, Starbucks Reserve coffees, 48-96 count Verismo and K-Cups Pods, and sale items. Cannot be combined with any other offers or discounts.